This Guide has everything for conducting a SWOT Analysis and setting objectives for your business. The ‘Small Business Guide to Completing a Business Planning SWOT Analysis’ is more powerful than the traditional SWOT Analysis as it gives you the actual tools to implement change. Has been tested and proven by the author on over 100 small to medium sized businesses in dozens of different industries. 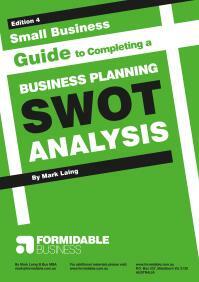 Contains easy step-by-step instructions for conducting a SWOT Analysis on your total business or its parts e.g. products, operations, investment decisions, etc. Has 3 checklists of the results of 25 SWOT Analyses of small businesses to identify the key issues for each of the 4 criteria. Lists the key mistakes made by business owners that minimises the effectiveness of a SWOT Analysis. Has instructions on how to conduct a brainstorming session and set SMART goals. In summary - how to use a SWOT Analysis to dramatically improve the results of your business. You don’t need to just analyse your business - you need the tools to make positive things happen. This Guide gives you practical information with proven actions to dramatically improve your results and achieve your goals. It is based on over 12 years of business coaching. If you want to make your business more successful, purchase this practical, action oriented guide now. AVAILABLE NOW for only AUD$19.75 (Australian Dollars Includes GST) - this is a 34% discount off the hard copy price. To buy and download your PDF copy immediately please click here.